The headwaters of the Green River seep from Mammoth, Minor, Sourdough and surrounding glaciers in the northern Wind River Mountains along the continental divide. Minor Glacier clings to the west face of Gannet Peak, Wyoming’s highest point at 13,804 feet. 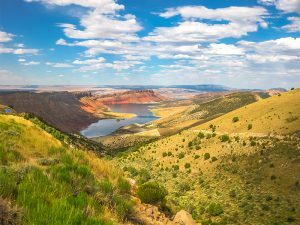 From this dramatic beginning, the water swells into one of the state’s biggest rivers and winds southward to the Utah border at Flaming Gorge reservoir. The roughly 4,000-square-mile Green River Basin in Wyoming is a desert where, for most of the winter, grass and shrubs poke through thin, windblown snow. In spring the river paints a stripe of bright vegetation through the otherwise high, dry sagebrush steppe, sheltering pastures and ranches along its edges. On the bluffs to either side of the river, the infrastructure of energy development juts from the sage. High in the Bridger Wilderness – a primitive area designated by Secretary of Agriculture Arthur Hyde in 1931 and established as wilderness when President Lyndon Johnson signed the Wilderness Act in 1964 – glacial melt water trickles through countless lakes and scree fields and gathers into a stream at the bottom of a V-shaped valley. The Green River starts its journey flowing north past Square Top Mountain, a 3,500-foot-tall isolated block standing between two glacial canyons, and into the Green River Lakes at the edge of the wilderness boundary. Downstream, the river sweeps west and then south, following a valley between the Gros Ventre and Wind River mountains and making the shape of a hook with its stem jutting out of the mountains into the upper Green River Basin. There, the Green flows past ranches and hayfields surrounded by the Bridger-Teton National Forest and then wends through a matrix of Bureau of Land Management and private land including large working ranches such as the Carney Ranch, Pape Ranches and the O Bar Y. The Upper Green is a corridor for migration of both domestic and wild animals. Each spring, ranchers drive several thousand head of cattle from high desert mesas north and up the river 100 miles or more into the mountains and the Bridger-Teton National Forest. More than a dozen ranches of the Green River Cattle Association share a 168,000-acre grazing allotment on Bureau of Land Management land on the mesas, and a 127,000-acre allotment on the national forest. It’s a three-week trip along a traditional stock route called the Green River Drift, 24 miles of which is a fenced driveway. The cattle drift back south in the fall at the first snow. The ranchers spend another month sorting their cattle from their neighbors’, before driving them back to the home ranches. Many species of wildlife also follow the river corridor. Between 1994 and 2003, Wyoming Game and Fish Department officials released more than 70 captive-bred trumpeter swans in the upper Green River. The birds follow the current downstream to find milder weather for the winter and then return to the upper stretches along the Gros Ventre and Wind River Mountains for spring breeding and nesting. The cracked, vibrato calls of sandhill cranes ring along the upper Green in the springtime. Hardy forage and the sparse snowpack make the basin an important winter range for as many as 100,000 ungulates, including about 59,000 antelope, the largest herd anywhere. Elk, deer, and pronghorn follow the path of the river during their seasonal migrations. The Teton pronghorn, for example, follow the Green upstream each spring nearly to its headwaters before crossing the Gros Ventre Mountains to Jackson Hole, where they give birth to their fawns along the Snake River in Grand Teton National Park. Traversing 170 miles between winter and summer range, this is one of the longest recorded land animal migrations in the western hemisphere. The Seedskadee National Wildlife Refuge, near LaBarge, Wyo., was established along 36 miles of the Green River just above the confluence with the Big Sandy River in 1965. Named for the Shoshone word for the Green River, “Sisk-a-dee-agie” meaning “river of the prairie hen,” the refuge shelters a range of species including waterfowl, shorebirds, raptors, songbirds, several kinds of fish, moose, deer, and smaller mammals. The refuge was created to make up for habitat lost when two dams – Fontenelle and, further downstream, Flaming Gorge – were built. Fontenelle Dam, just upstream of the refuge, houses a 10-megawatt hydroelectric generator and blocks water in 20-mile-long Fontenelle Reservoir. About 50 miles downstream from Fontenelle Dam, the Green flows under Interstate 80 and the Union Pacific Railroad near the town of Green River, Wyo., where John Wesley Powell launched two expeditions in 1869 and 1871 to explore the river through and below its confluence with the Colorado. Powell described the Green River as flowing “from the land of the snow to the land of the sun,” and he named Flaming Gorge, a canyon that reaches across the Wyoming- Utah border, for the brightly colored cliffs that towered above the water. In 1963, the US Bureau of Reclamation built the 502-foot-tall Flaming Gorge dam, flooding the canyon. The dam creates a 91-mile-long reservoir and its hydroelectric generators produce 150 megawatts of electricity. 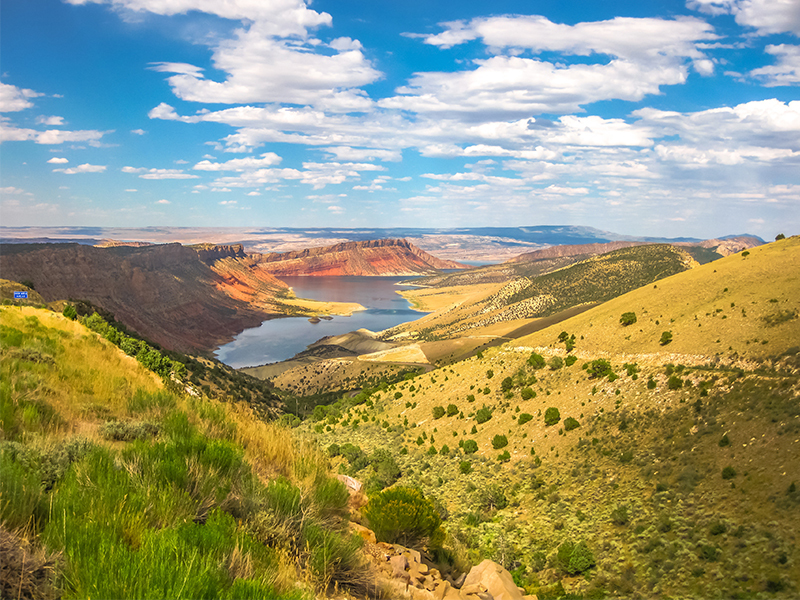 Flaming Gorge is part of the Colorado River Storage Project, which was designed in the 1960s to ensure that downstream states receive their allotted water. Below the Flaming Gorge Dam, the Green River swings briefly through Colorado, passing through Dinosaur National Monument and crossing back into Utah. The Green joins the Colorado River in Canyonlands National Park, 730 miles from its headwaters in the Wind River Mountains. The Colorado is dammed at Lake Powell in southern Utah and Arizona, flows through the Grand Canyon and is dammed again at Lake Mead in Nevada. As many as 25 million people live in the Colorado River watershed. Because irrigation and cities such as Las Vegas consume so much water, the river runs dry before reaching its historic mouth at the Gulf of California. As is true for rivers throughout the arid west, the Green has seen many forms of commerce and natural resource development in Wyoming. The Eastern Shoshone was the primary tribe in the Green River Basin in the years before the arrival of European and American explorers. The Shoshone traded and battled with the Ute tribe to the south and were allies of the Bannock Tribe to the west. European-American explorers arrived in the Green River Basin early in the 1800s. In 1812, Robert Stuart, a member of an expedition organized by John Jacob Astor to establish a post for the American Fur Company on the Columbia River, entered the Green River Basin while traveling back east from the Pacific Coast. He discovered South Pass, a low point in the Continental Divide on the eastern rim of the Green River Basin. In 1823, Jedediah Smith and a team of young trappers, with the help of Crow Indians, rediscovered the pass as a route to the beaver-rich Green River Basin. Smith, his employers William Ashley and Andrew Henry and others are credited with creating the mountain-man rendezvous, where trappers met once a year to trade furs for whiskey, credit and their coming year’s supplies. The first rendezvous was held on the Henry’s Fork tributary to the Green River in 1825, near what’s now the Wyoming-Utah border. A half dozen rendezvous were held in the upper Green River Basin near a historic site called Trapper’s Point between 1833 and 1840. At Trapper’s Point, about 6 miles west of present Pinedale, Wyo., the New Fork and Green rivers curve toward one another and then away, creating a geographic bottleneck that funnels migrating deer and antelope together. An archeological dig at this site revealed 7,000 year old charcoal pits and pronghorn bones, indicating that hunters have targeted wildlife at this critical place for millennia. Because South Pass provides one of the easiest passages over the Continental Divide, the Oregon, California and Mormon pioneer trails followed the fur traders along this route. The Green River – 20 feet deep and moving fast during the summer – presented one of the most dangerous crossings on the trails. Several ferries operated on the river, and pioneers cut off from the trails to seek safer crossings to the north and south. Settlers continued to use the emigrant trails through the end of the 19th century even though the first transcontinental railroad was completed in 1869. The Pony Express followed the emigrant route across the Green River Basin in 1860 and ‘61. In 1867 an entrepreneur named Charley Deloney contracted with the Union Pacific Railroad and set up a tie hack operation in what is now the Bridger-Teton National Forest along the Upper Green River. Between 1867 and 1869 a team of 30 men cut ties, skidded them to the Green River, and floated them 130 miles downstream to the town of Green River and the UP. Tie hacking stopped in this area until 1895 and then picked up again with various timber companies operating until 1952. Remnants of old tie hack cabins can still be found along the Upper Green. In the late 1860s, coal mines opened near the town of Rock Springs in the southern part of Wyoming’s portion of the Green River Basin. Uranium and gold have also been mined in the area. The basin currently contains extensive natural gas development, including more than 8,000 wells with another 4,000 proposed. One of the world’s largest trona deposits – a substance processed into soda ash, used for making glass, detergents, baking soda, and other supplies – is located in Sweetwater County in the southern part of the basin. Several hundred workers mine trona underground here producing as much as 90 percent of the nation’s soda ash. Pristine lakes and alpine meadows of the Wind River Mountains overlook active energy development, while extensive wildlife populations merge onto the long-standing cattle ranches in the Green River Basin. These days, a group of irrigators are trying to get funding for a new dam on the Green River upstream from Trappers’ Point near a place known as Warren Bridge. The irrigators say Wyoming should store more water instead of letting it slip away to downstream states, but economists say the cost of the project would outweigh the benefits. At the same time, fishing and boating enthusiasts oppose flooding a favorite stretch of wild river, and note that the reservoir backed up by the dam could also drown the bend of river where migrating pronghorn cross each spring and fall. This dispute is only the latest example of attempts to balance use of resources with the harsh and beautiful landscape of the basin. And while the dam proposal was rejected by the Wyoming Water Development Commission late in 2010, the history of this area has already shown that determination can achieve even the most unlikely enterprise.